This Tutoring Center is located in a highly visible location in a high-traffic shopping center, located on the primary thoroughfare through the city. The Center opened for business on June 30, 2012 and has been making a difference in the lives of children in this community for over 4 years. We have loyal families that come as far as 2 counties over for the experience our Center offers; knowledgeable/passionate instructors, a comfortable, bright inviting learning environment, outstanding learning programs, reasonable prices, caring owners. We have multiple families that have 2 and even 4 of their children enrolled. 70% of the students are from the city where the Center is located and 30% are from other surrounding cities. The Center has seen increased revenue each of the 4 years in existence and has potential for revenue growth through the addition of SAT/ACT Prep Program. •	Current hours of operation are less than 25 hours per week. •	No previous experience is required as Full Training will be provided. •	There are no similar Centers with our price point in the surrounding area. •	The area is a moderately high growth area. All furniture, fixtures, on-hand materials and main computer and printer included in the purchase price. Some owner financing available. Owner is selling to hopefully enjoy retirement. •	Highly trained and knowledgeable staff. •	Instruction techniques which are unique in the industry. •	Loyal, repeat customer base that is expanding. •	Location, Location, Location … 35-40% of enrollments are from walk-ins, The rest are from internet searches, referrals and siblings. 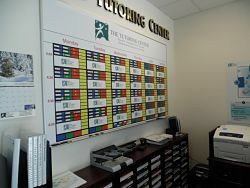 THE TUTORING CENTER'S "WINNING FORMULA"
Over two decades of testing and refining, THE TUTORING CENTER has developed a "winning formula" of one-to-one instruction combined with "The Rotational Approach to LearningTM." This type of instruction yields far greater results than small-group instruction offered by any of our competitors. All other learning centers and school-based programs use small-group instruction, where each instructor usually sees 3, 4, or even 5 children at one time! Education and after-school learning is one of the most important growth industries in the United States.... even if the economy is not doing as well as it should. Helping children in your community achieve academic success, motivation, and confidence is an incredibly rewarding experience and continues to be one of the most important issues facing our country. The U.S. educational market is second only to health care as a percentage of gross national product now exceeding $700 billion. Tremendous profit potential exists for the private sector to provide outside supplemental services and can take advantage of the growing student population while at the same time finding ways to streamline the inefficiency that exists in schools today. With the growth of supplemental education in the United States today, THE TUTORING CENTER is a great choice for a career. If you would like further information about this The Tutoring Center for sale please complete the form below and submit.